The tiny neighbourhood of Val-Tétreau is a cyclists’ paradise. Located just minutes from Gatineau Park, it sits at the edge of the Voyageurs Pathway, a scenic 30-kilometre trail that hugs the Ottawa River, offering spectacular views of the capital. In 2014, architect Isabelle Bradbury, who had been offering the granny flat attached to her house as a vacation rental for a couple of years, decided to make cyclists the cornerstone of her business. 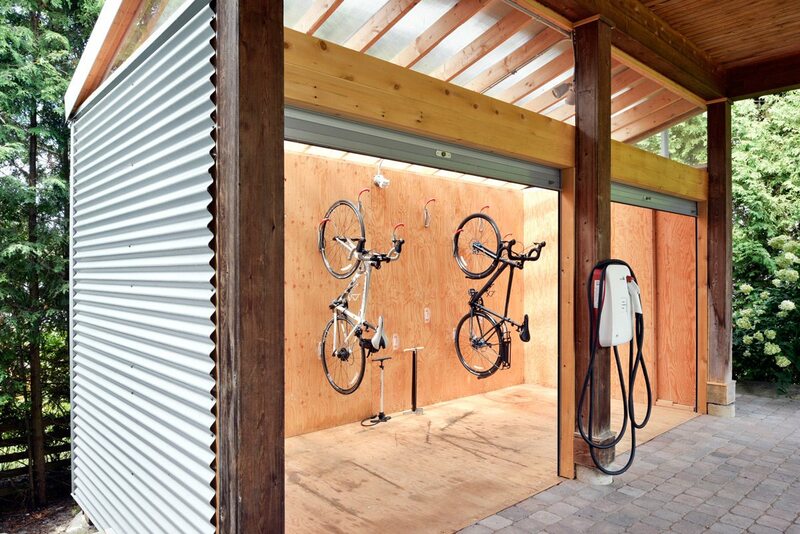 Build it and they will come, she thought, as she set about designing and constructing a combination bike shed and car-charging station at the back of her carport. Her decision led to immediate success, attracting the attention of seniors on cycling tours, triathletes, and cycling clubs. “My renters are a most fun-loving and energetic bunch,” says Bradbury, noting that a house that can sleep 10 and a shed that can hold 10 bicycles is a rare find. 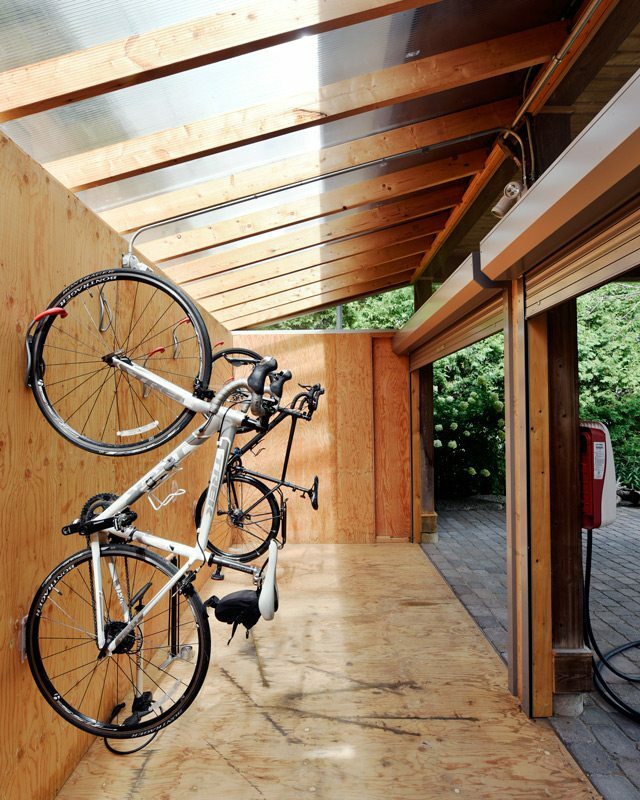 It’s a bonus that the roomy carport in front of the shed provides the perfect spot for cyclists to congregate, hang out, and tune up bikes on rainy days. The shed is a fairly simple structure, with a wood frame, corrugated-metal exterior, and plywood interior. A sloped polycarbonate roof keeps the rain out and allows light to flow into the space during daylight hours. 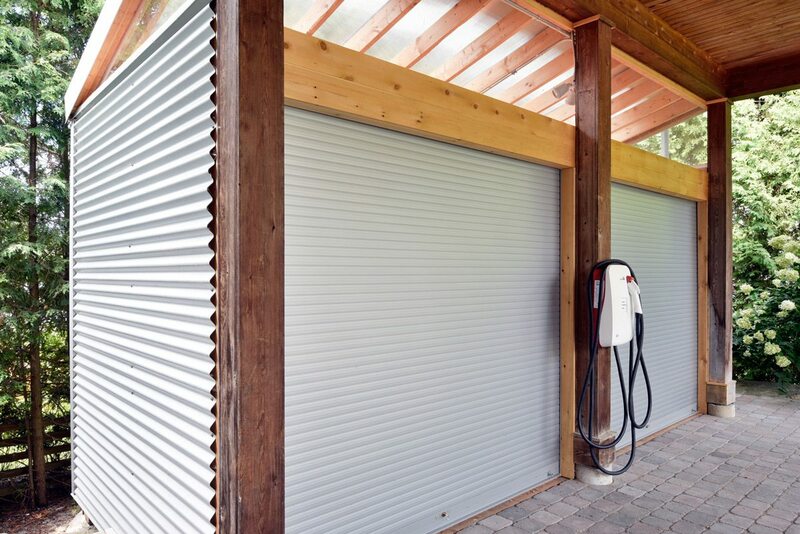 Because the space above the garage doors is open to the elements, air can circulate, ensuring that the shed never gets overheated.